With the recent confiscation (Dec. 2001) of thousands of Asian turtles and tortoises in Hong Kong, the animal markets in China (including Guangzhou) "suffered" a temporary setback. Ongoing survey work as well as a recent brief photodocumentary of the markets (Spring 2002) have shown that the markets have returned to full strength once more however. While one could never fully describe the markets without visiting them and thus experiencing them firsthand, the following is meant to continue the work of others in trying to let the world know what the exact situation is and what species are currently being offered in these markets. Instructions - this presentation can either be pursued from start to finish via links at the end of each page, starting here or pages may be viewed individually by clicking on the linked text below. 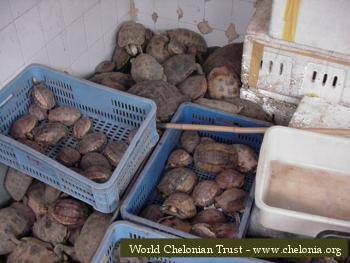 To discuss issues relating to turtles and tortoises, their care and conservation, join the free World Chelonian Trust Online Email Community by typing in your email address in the form below and clicking the Yahoo groups logo.